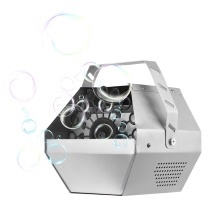 Compact size bubble machine designed for wedding, birthday party, live concert, bar, KTV, stage effect, etc. With high velocity fan makes bubbles rise quickly in the air to create dreamy and romantic atmosphere. Comes with a wireless remote control for easy and flexible usage. Portable and lightweight design, with removable bracket for safe and convenient carry. Constructed in rugged metal housing, it&apos;s wearable to use indoors and outdoors. Bubble oil is not included. Please keep it dry and place it onto a clean, flat and solid surface before using it.